For fans of the HBO original series, Game of Thrones, winter has finally arrived. In the eighth, and final, season, the story, based on George R.R. Martin’s best-selling A Song of Ice and Fire series, reaches its conclusion in the battle for control of the Seven Kingdoms of Westeros. Watch parties will abound, as the final season debuts on April 14. Impress your friends with these clever appetizer and beverage concepts. This cocktail, inspired by House Greyjoy, was crafted with Deveron 12 Year Old Single Malt Scotch from the Deveron Distillery in northeastern Scotland. The scotch is nuanced with the flavors of dill and caraway from Aquavit and a touch of dried seaweed from Dashi. Created by Andrew Record, National Single Malts Ambassador for Deveron in San Francisco. Dashi Syrup: Make a simple syrup by combining a near-boiling 1/2 cup of water and 1/2 cup cane sugar. Steep one sheet of nori and 1/2 cup of bonito flake for one minute in hot liquid. Fine strain to remove all solids. Chill syrup before using. Cocktail: Combine ingredients in shaker tin over ice. Shake vigorously. Strain into large rocks glass over ice. Garnish with sheet of seaweed. Inspired by House Baratheon, this cocktail pairs Royal Brackla 12 Year Old Scotch Whiskey with the richness of Fino sherry and a zip of passion fruit to create punch fit for a king. 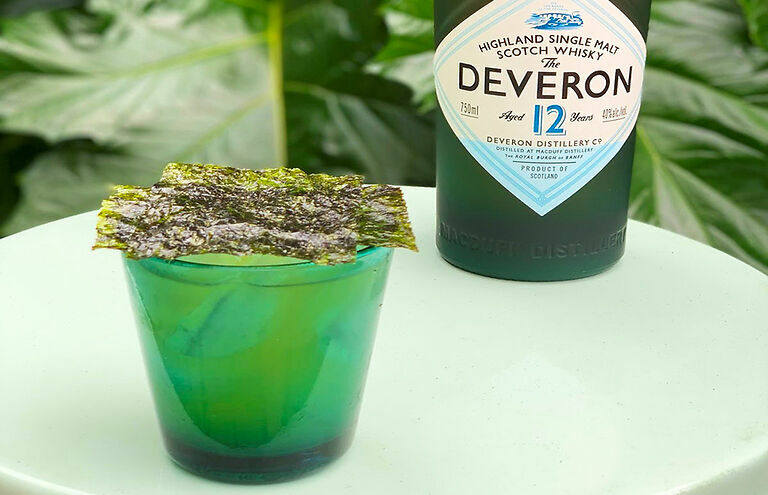 Created by Andrew Record, National Single Malts Ambassador for Deveron in San Francisco. Combine all ingredients over ice in shaker tine. Shake vigorously. Strain into tall glass. Top with soda. Garnish with handful of grapes. The Dragonglass cocktail was created by Hemant Pathak, Mixologist of NYC’s Michelin Star restaurant Junoon. He says “One way or another, the catalyst in the final season will have something to do with Dragonglass!” The cocktail will be served in the restaurant starting April 14, a new addition to the robust Game of Thrones themed cocktail menu. Stir all ingredients with ice. Serve in small wine or rocks glass with ice sphere. Garnish with Angostura Amaro. The following cocktail and appetizer recipes are courtesy of celebrity caterer Andrea Correale, founder and president of Elegant Affairs. The White Walker Martini recipe follows, with links to the appetizer recipes below. A GOT watch party is the kind of thing Andrea does every day for her clients, which include Brooke Shields, Mariah Carey, Jimmy Fallon and P. Diddy. In a cocktail shaker, place the dry ice (be careful handling dry ice, read instructions carefully). Add in all other ingredients. Shake well and strain (without the ice) into a cold martini glass.